A licensed electrical contractor calculates anticipated loads and installs the correct circuit breakers in the service panel according to local electrical codes. Important is that these calculations are based on information provided by the building’s owner or operator and must be accurate. That said, most of the wiring for a residential structure is standard. Exceptions include computer and entertainment centers, kitchen and laundry areas, and local fire safety requirements. Wiring and breaker sizes vary with load requirements for each fixture and the potential accumulated loads for the branch circuits. The breakers use electromagnetic contacts or heat to sense overloads. This includes ground fault interrupters, arc faults, and high and low voltage fuses. Service equipment like water heaters, HVAC systems, fans, and outside motor controllers require a single dedicated circuit to match manufacturer specifications. Separate disconnect switches are placed at all inside and outside motor controllers to ensure technicians have local control of the power shut off. Once all the wiring is in place and junction boxes are mounted and secured, the walls and ceiling are ready to receive insulation. 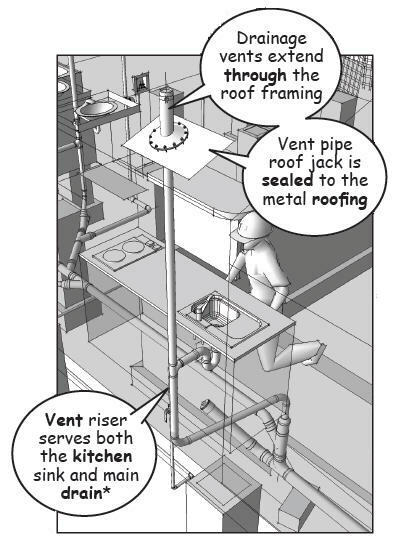 This work begins with a final check of the rough-in for the plumbing supply, drain and vents lines, the HVAC ducts, service lines, and the electrical wiring. In some jurisdictions, authorization is required from a building inspector because once the insulation is in place, many systems will no longer be visible. The power entering the building from the utility main is an alternating current. Standard connections use one hot, one neutral or return path wire, and a bare copper ground wire. In theory the hot and neutral wires can be switched and the power will flow, but it is important to keep them in phase because ground and neutral wires run back to the same connection within the panel. The ground wire adds a safe path back to the grounding rod buried near the service connection. 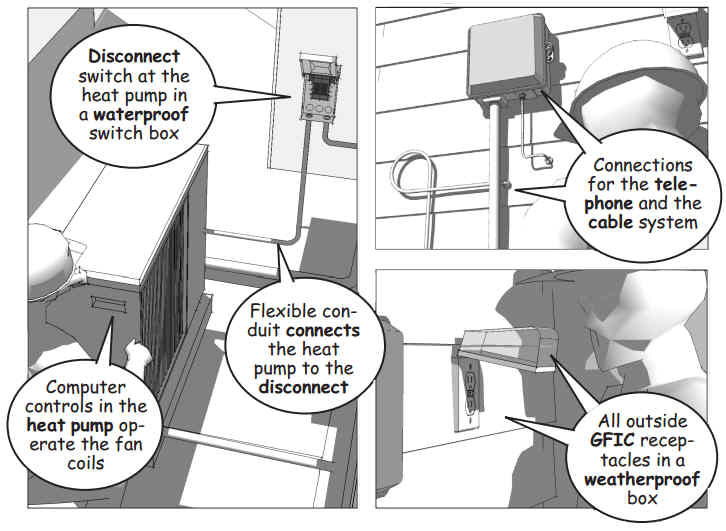 Ground fault interrupt circuits (GFIC) are required for kitchen, bathroom, and outdoor weatherproof outlets. GFIC prevent electrical shock by monitoring the current flow from the hot to neutral wires. Any imbalance is sensed and the circuit is shut off. 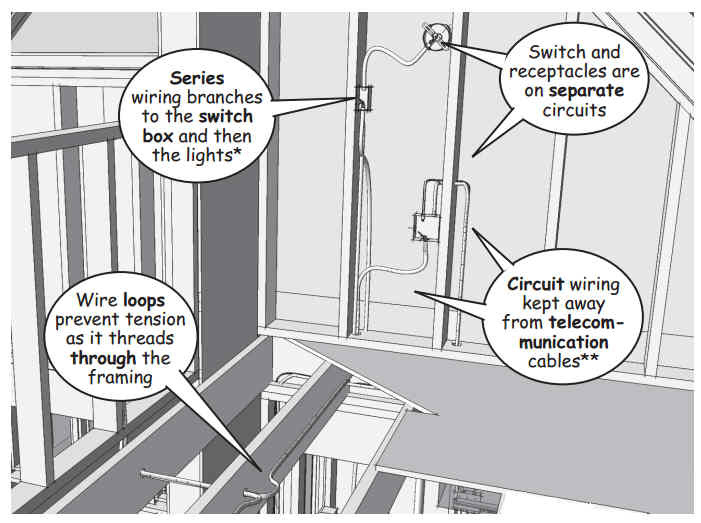 Note that in many jurisdictions arc fault interrupters are also installed at the panel to sense shorts in electrical cords and fixtures on the branch circuits. 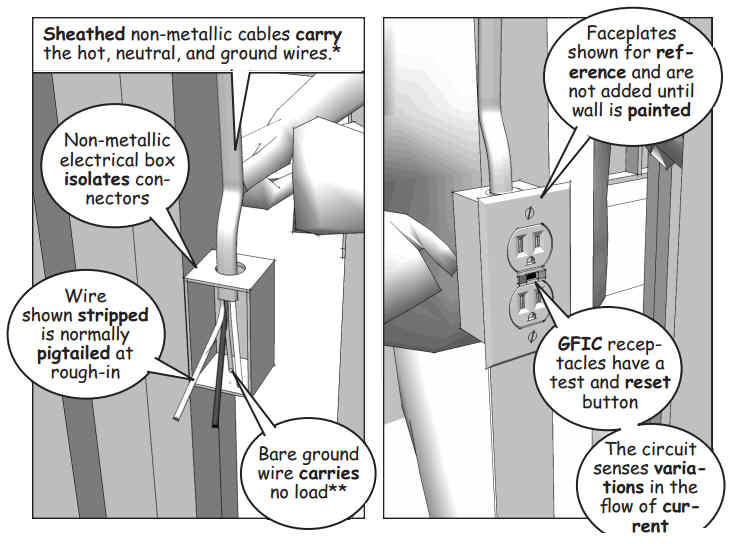 The breaker sizes for receptacle circuits are estimated by the user and the electrician according to anticipated use. Computers and peripheries complicate the calculations, but too much supply can be as bad as too little. Branch wiring runs from the service panel through the wall and floor framing to the electrical boxes. 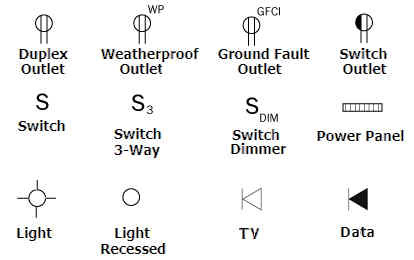 Lights and fixtures are wired on separate branch circuits. Lights closer to the panel are wired directly and controlled with a switch loop, see www.electrical-online.com. These loops can be wired in series, or wired to respond to individual switches. Steel plates protect wires from possible damage. Electrical boxes are checked to make sure they are secure and shielding is added near any electronics to prevent possible interference. The finished fixtures and plates are stored offsite by the electrician and mounted after the drywall and painting are complete. As we’ll see later, the electrician tests and certifies the installation after the finish work is complete. No power enters the building without his or her certification. 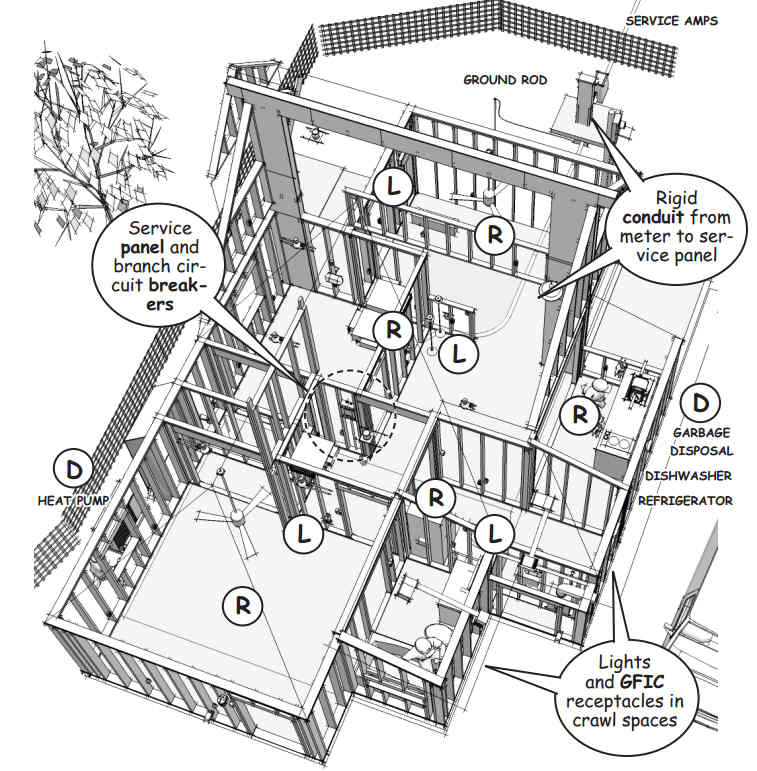 The electrical service that supplies the building is provided in two stages. First as temporary power to a post installed by a licensed electrical contractor according to the site utilization plan. The post has a meter and grounded connections for use during construction. The second stage of electrical service begins with the installation of the permanent meter and the main disconnect switches at the utility connection. 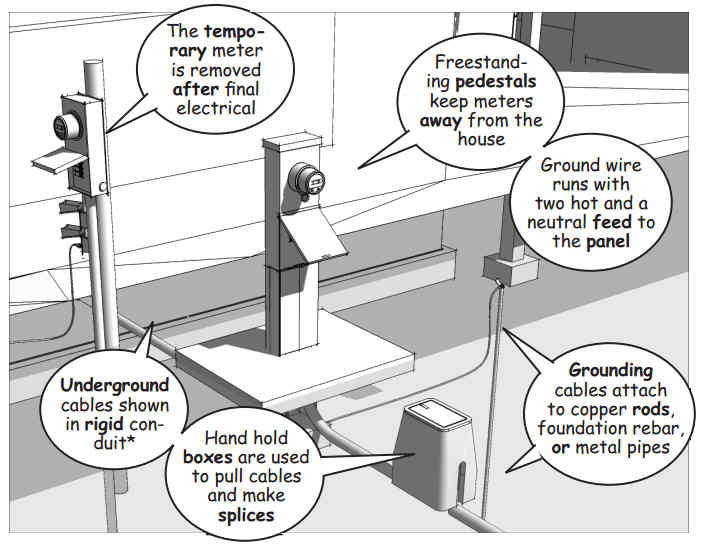 The meter in mounted on an exterior wall of the building or as a free standing meter pedestal. The supply side of the meter is grounded to a copper rod driven into the ground or to a wire attached to the steel reinforcing in the foundation footer. 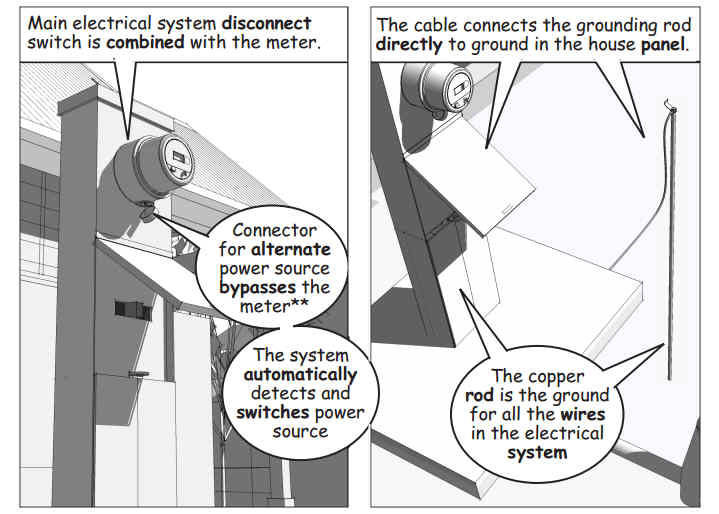 When the meter is not mounted on an exterior wall, an underground cable runs from the utility connection to the service panel. An electrical conduit makes it easier to change or upgrade this cable to accommodate future needs. 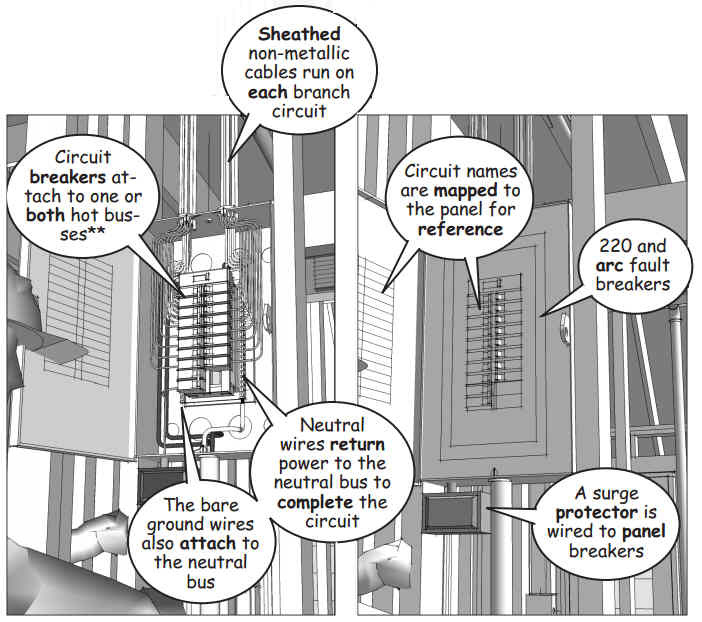 The anticipated loads for branch circuits and circuit breakers are determined by the electrical plan. These loads vary according to the number of receptacles and switches, as well as the specifications for the equipment and appliances that service the building. For detailed information on basic electrical installations and residential wiring, see this DIYnetwork article. 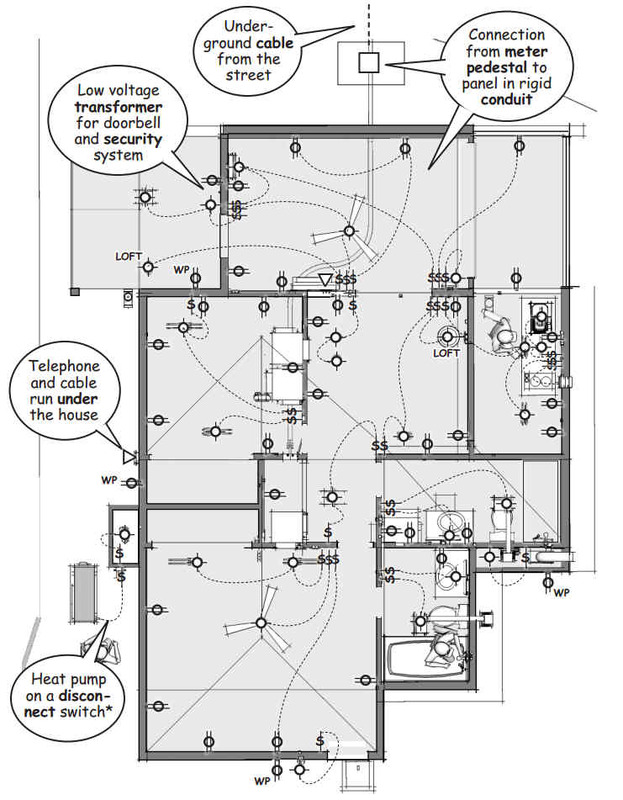 The electrical plan for a residential building looks a lot more complicated than it really is. This is because licensed electrical contractors are careful to comply with local electrical codes that clearly specify materials, connection, and methods of installation. 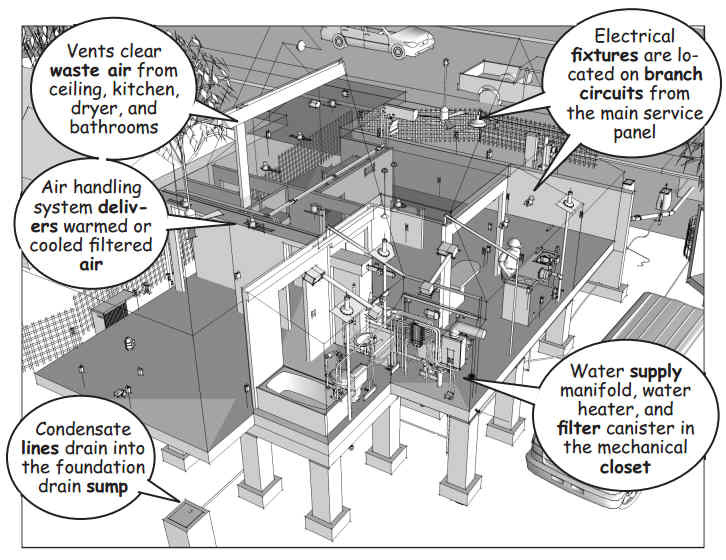 Electrical contractors use the electrical plan to understand the general layout of the building, note any special features or unusual conditions, and apply a rule of thumb based on the number of outlets, switches, fixtures, and special connections that are specified. 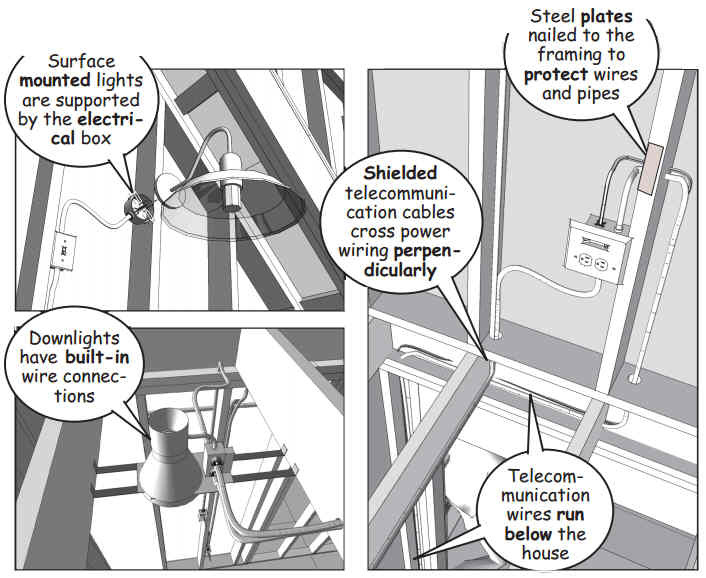 The plan uses a standard set of symbols to show the location of the service connection, meter location, and interior distribution panels. It also shows the placement of outlets, switches, and the fixtures that will be required. The locations shown are not exact. 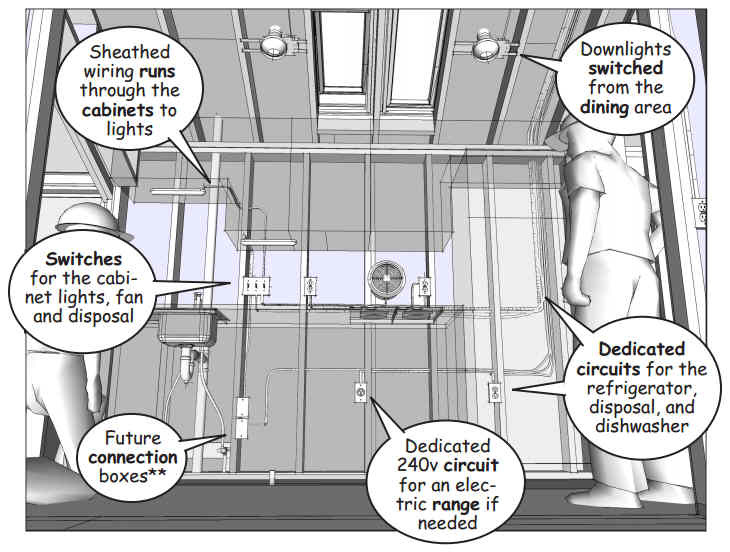 Final placement is determined by the electrician and owner just before the subcontractor begins the work to rough-in the wiring and junction boxes. Circuits are balanced according to anticipated loads and the detailed requirements of state and local electrical codes. 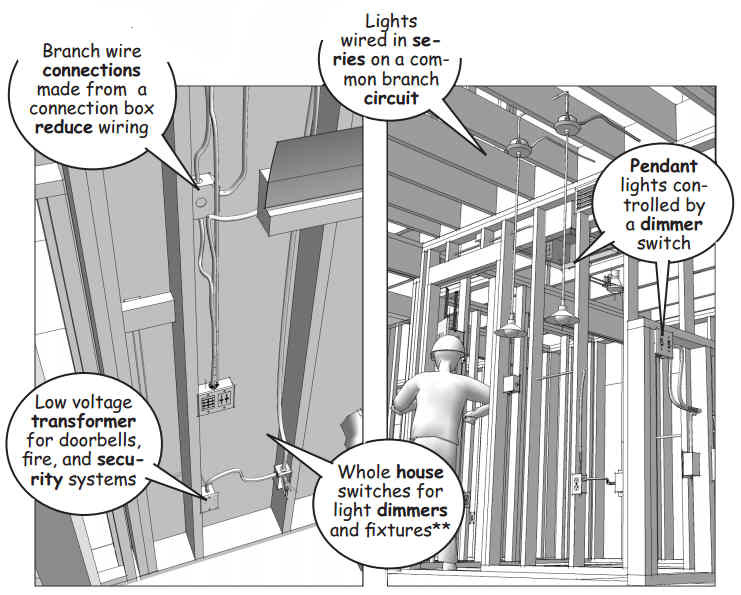 Generally, there are three types of circuits in a residential building. 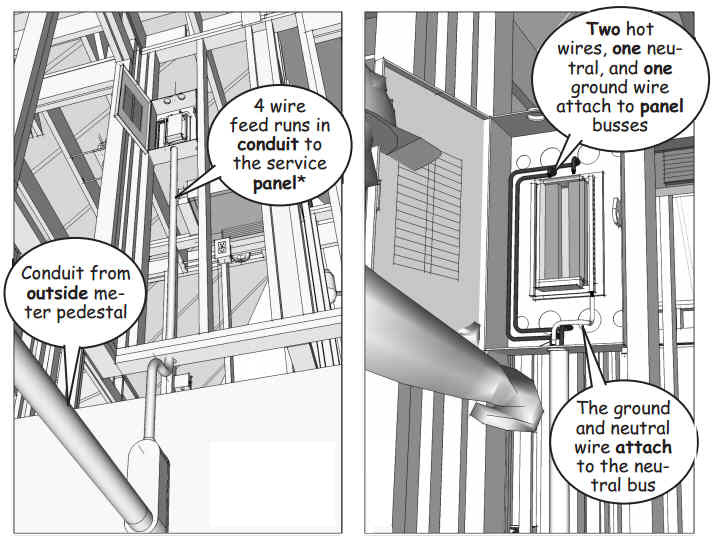 Wiring to all the required connections depends on the location of the service panel and the structural framing members that will be drilled for the installation. The total amperage entering the house from the utility provider is divided into branch circuits at the service panel. Each branch is designed to carry anticipated loads for receptacles, lights and switches, and dedicated fixtures on that circuit. For safety, it’s important that an experienced, licensed electrical contractor calculate the loads represented by the electrical plan and install the correct circuit breakers. Ducted air conditioning systems are easier to access and maintain than ductless systems because there’s a single outdoor unit and a single indoor air handler. Regular filter changes are required, but frequency depends on local conditions. 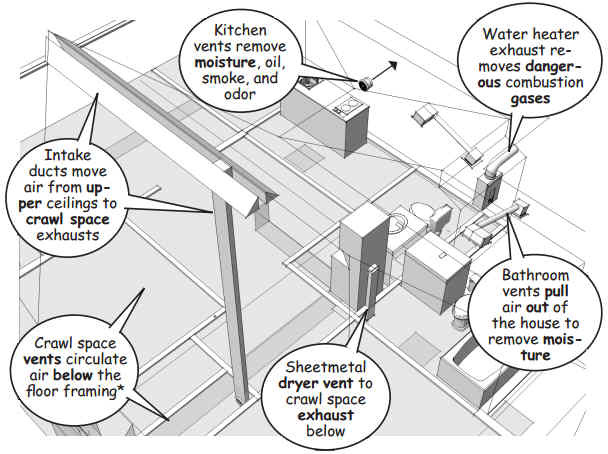 The ducts themselves do not require cleaning under ordinary circumstances. On the other hand, ductless air conditioning systems, also known as “split systems,” are flexible to install and efficient to operate. 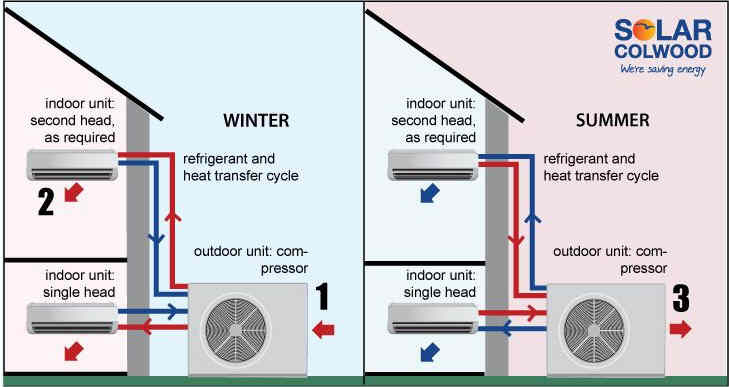 They include outdoor heat pumps that deliver conditioned refrigerant to indoor air handlers called fan coils, or blowers. The coils in the air handlers are cooled or heated by refrigerant supplied from the heat pumps. A circular fan blows room air over the coils to condition the space. 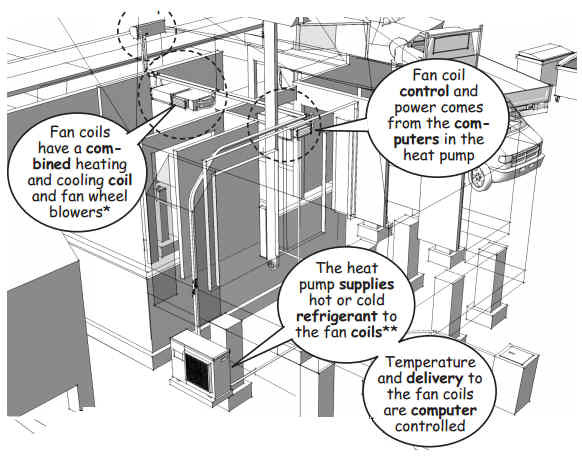 The temperature of the coils and fan speeds are regulated by programmable controllers. Individual air handlers make it possible to heat or cool the spaces separately. 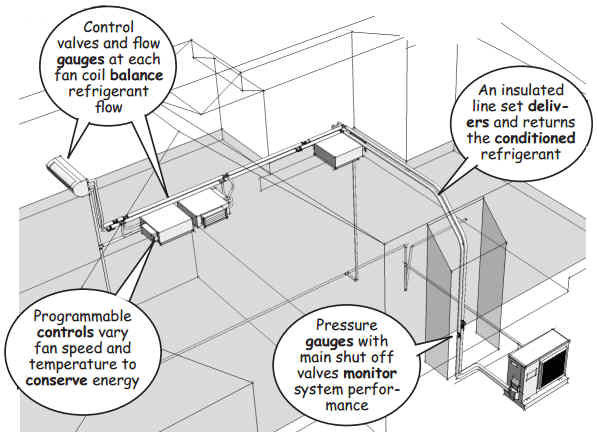 This reduces energy demand and increases operational efficiency because the units are regulated independently. 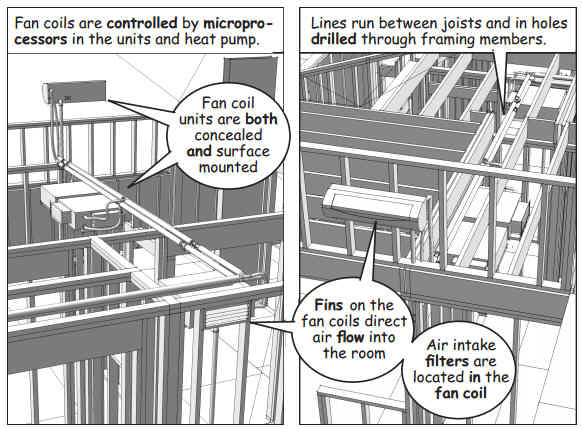 Control wiring as well as supply, return, and condensation tubing are installed as a bundled line-set within the framing. The line-sets are placed before interior finishes are completed. 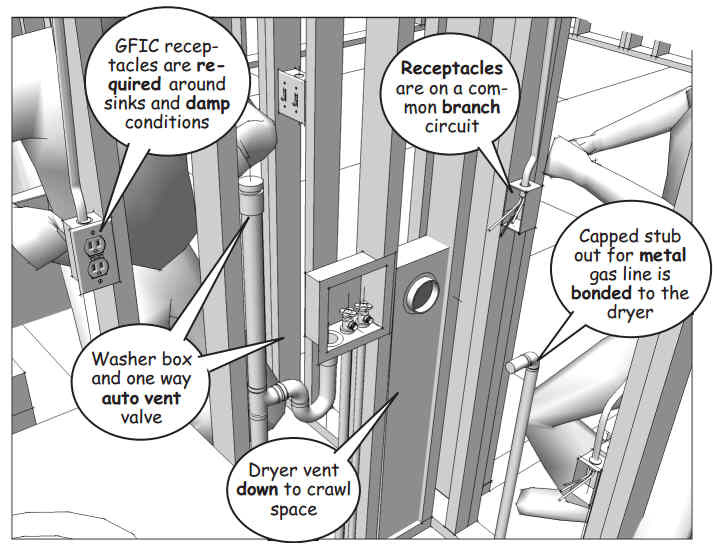 The distance from the outdoor unit to the indoor air handler is limited by the manufacturer and system specifications. 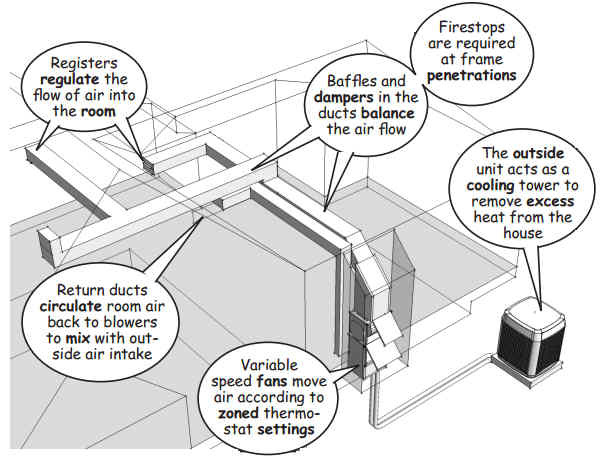 Room layout and the location of the blowers must be carefully considered to minimize draft and stagnant pockets of air. A dryer cycle dehumidifies indoor air to improve room comfort. This reduces the need for conditioned air in a well insulated building. 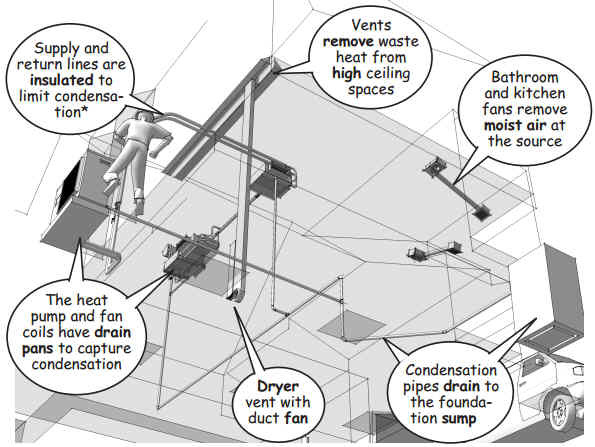 In areas with high humidity, condensation must be carefully controlled to prevent damage and mold. A pan captures condensation below the coil and drains the moisture through flexible tubing to an outside sump. 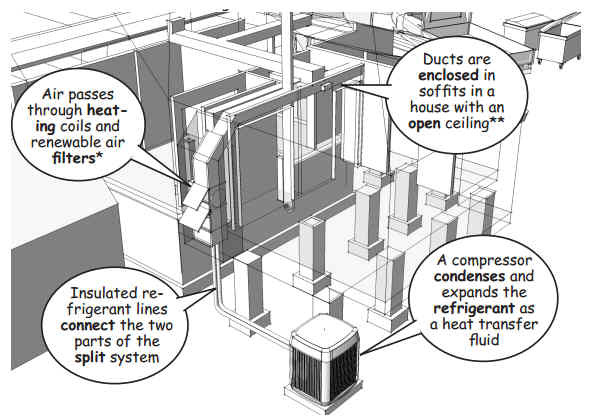 Direct ventilation is also necessary to reduce humidity and heating and cooling loads from point sources like bathrooms, appliances, kitchens, and high ceilings. 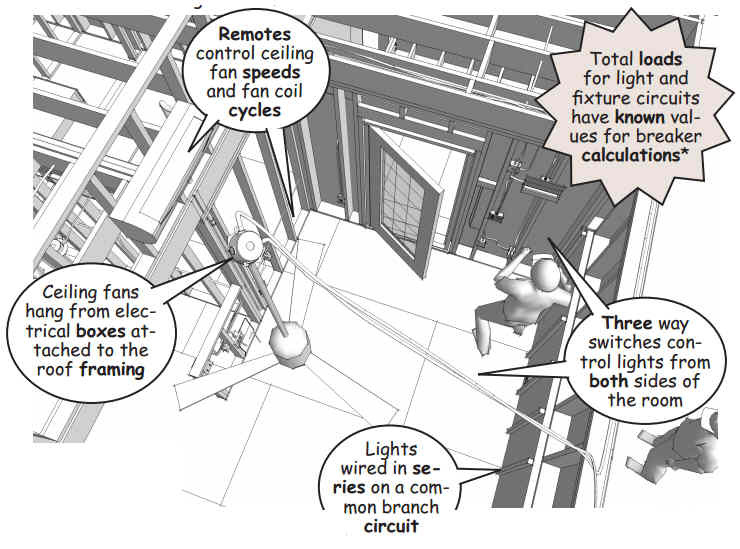 Power to the fans and control circuitry are supported by electrical wiring installed during the next phase of the construction. 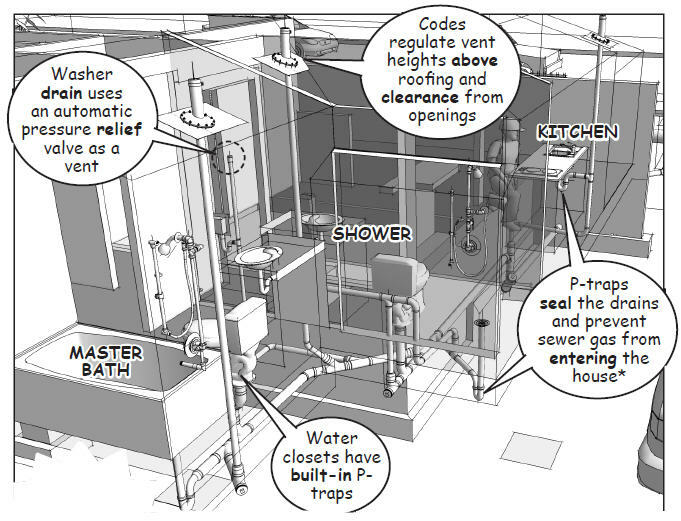 The plumbing works as a system. Hot and cold water supplies are delivered through pressurized lines to the plumbing fixtures and unpressurized drains remove the waste to a sewerage disposal system. These drains rely on gravity and the correct slope to sustain the flow of liquid and solid waste to the sewer main. 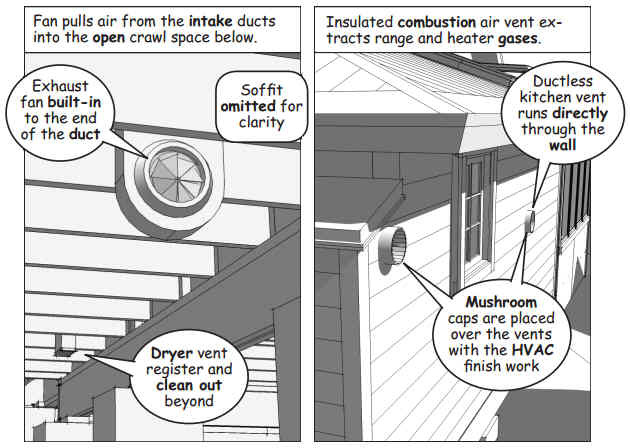 Vents relieve the negative pressure created by the flow. 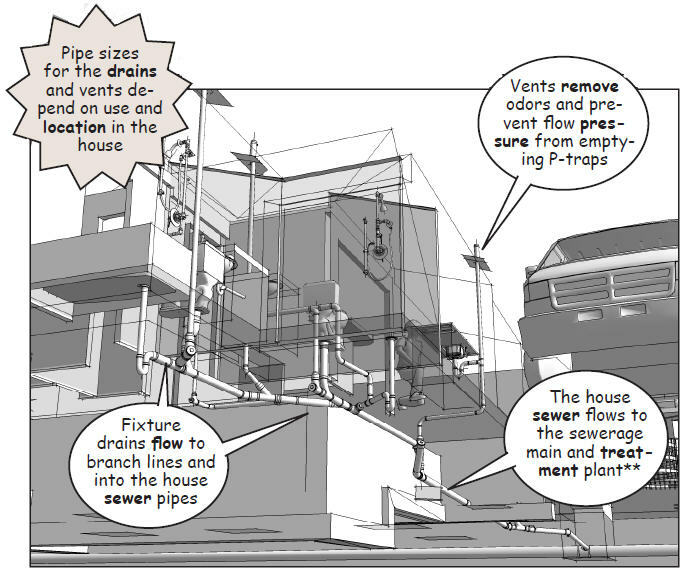 The size and location of the drains and vents are determined by anticipated loads, site conditions, and the local building code. 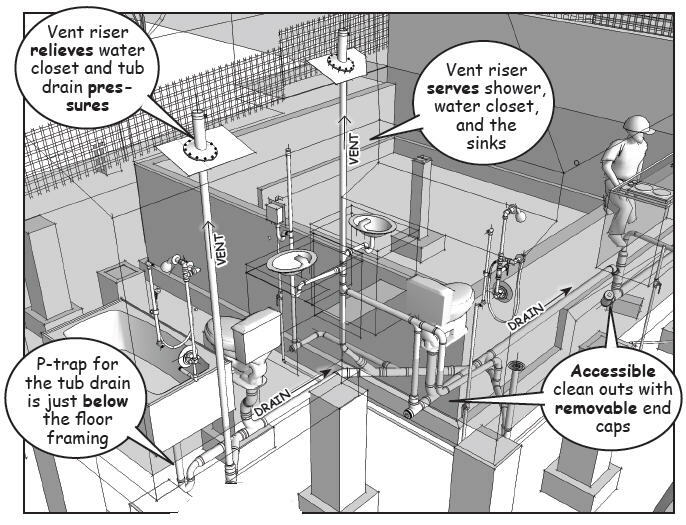 Plumbing fixtures are connected to branch and main lines that carry the waste to a sewer main. An onsite septic system is used where offsite sewerage treatment is not available. The drain from a sink is sized according to anticipated use. In most cases, the dishwasher and garbage disposal connect to the drain line from the kitchen sink. Under counter relief valves are used as vents for island sinks. Special permits and meters are required to “hook-up” to water and gas mains. The meters are installed by the plumber and certified by the service provider. The utility companies controls the supply lines with lockable street-side shut off valves. Emergency shut off valves are required on the customer side of a gas meter in most earthquake regions. Though permits are required, sewer connections are not normally metered. 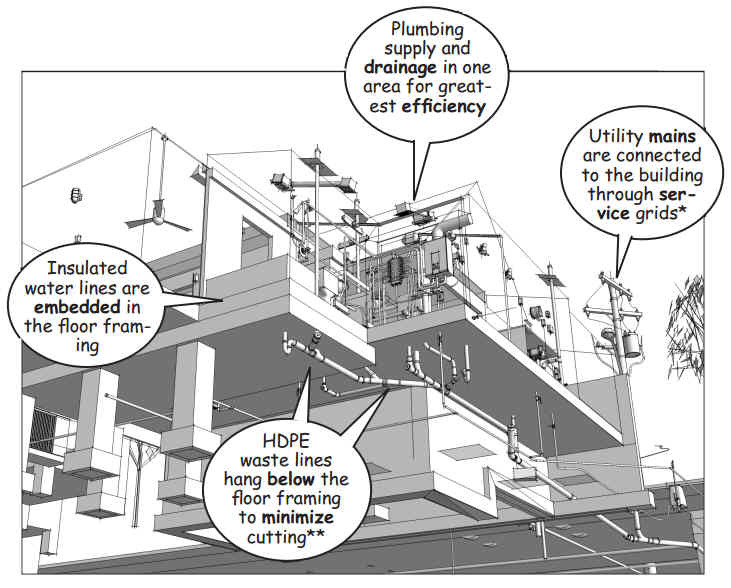 Instead, a central waste line flows from the building to the sewer main (see Preconstruction). 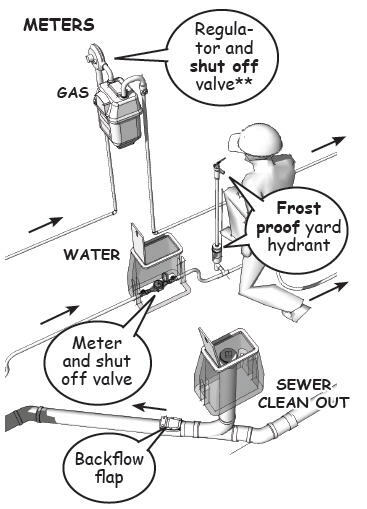 Backflow valves are required to block reverse flow from flooded sewers.